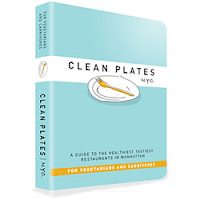 NYMAG's Grub Street posted a quip about Clean Plates NYC a new NYC Healthy Dining book coming out on March 31st. It details the author's 75 healthy dining picks. Restaurants include Caravan of Dreams, Candle 79 and Gotham Bar and Grill. It's a book for vegans, vegetarians and carnivores alike. It's got a minimalist aqua blue book cover that I like. The authors? Licensed nutritional consultant Jared Koch and food writer Alex Van Buren. A few of my faves made the list, but as Grub Street reported a few biggies did not. Daniel, Per Se and even Balthazar's didn't make the cut. Yay. I agree, with a little guidance, Chipotle can be healthy. Read the entire post on NYMAG and check out the Clean Plates website here.